In March 2000, Oldways and the The American Cheese Society joined forces to assemble an international coalition- the Cheese of Choice Coalition – in response to the murmurs that the Food and Drug Administration (FDA) was threatening to change the regulations about the sale of raw milk cheeses. The United States allows the sale of raw milk cheeses aged for more than 60 days, under the assumption that 60 days of aging is enough for the acids and salts in cheese to help protect against harmful pathogens like listeria, salmonella, and E. coli. The coalition’s mission is to fight to preserve the rights of individuals to buy unpasteurized (raw milk) cheeses. (Oldways) Raw milk activist and naturopathic physician Ron Schmid characterizes microbiopolitics of pasteurized milk this way: “Pasteur’s mechanistic understanding of disease took away the individual’s power to prevent it, and placed the mandate to cure squarely in the hands of the medical professionals” (Paxson) . For Schmid, the the power to prevent illness from raw milk consumption includes both government regulations and knowledge in medical professionals as well as careful production practices by the individual. That milk from small herds of grass-fed cattle that never see a feed lot contains beneficial bacteria to cultivate diverse intestinal ﬂora and fauna that could enable the human body to protect itself from disease. After Pasteur, the realm of food safety has practically became a medicalization of food and eating and people want to be able to accept in the potentialities of collaborative human and microbial cultural practices. 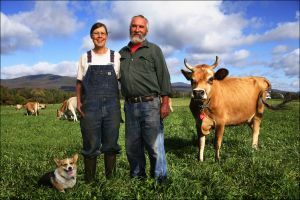 Heather Paxson is an associate professor in MIT’s Department of Anthropology studying America’s artisanal cheesemakers, a politically mobilized group of small-scale farmers and artisans who crave the freedom to produce and eat any kind of cheese they desire, in opposition to government regulations. Paxson has defined American artisinal cheesemakers as those who use “sensory evaluation in their cheesemaking, such as running a finger through freshly set curd to decide if it’s ready to cut.” As of 2010, the number of these artisinal dairy farms in American was just under 400. (Gudrais) A handful of these creameries have been making cheese for a century or more, passing down the knowledge through generations. However, a majority of American artisanal cheesemaking began in the 1980s, and it was around this time that local farming and dairying gained popularity in a response to the ‘back-to-the-land’ movement. Most of these new cheesemakers, serious about their craft, looked to methods tested by time by visiting Europe or corresponding with farmers there to determine which types of cheese and which grazing animals did well in climates similar to the locations of their own creameries. (Gudrais) The larger part of raw milk cheeses made in the US are made on a very small scale with milk from the maker’s own animals or from neighboring farms and without factory equipment. Compared to industrial cheese manufacturing facilities, the risk of contamination is non-existent for these small-scale family farmers – such as the Lazor family. For the cheesemaker, the difference between pastuerization and raw milk is that pastuerization neutralizes enzymes and bacteria that develop the unique textures and flavors and produce character and complexity unique to that cheesemaker’s cheese. Many claim that it is impossible to find in that from pasteurized milk. (Although, it must be said that there are great cheeses made from pastuerized milk.) It is also claimed that pasteurization destroys enzymes and bacteria that have health benefits. The French go as far as to call cheese made from pasteurised milk as dead cheese – and that is the whole point of the pasteurisation process — death. Although the Food and Drug Administration states pasteurization reducing milk’s nutritional value as a myth, (FDA) there is no mention by the FDA about having pasteurized cheese that is great tasting. All cheese producers, industrial and artisan alike, face restrictions on getting raw-milk cheese to U.S. markets. By U.S. law (21 CFR 133.182), cheese made from raw milk must be aged at least 60 days at a temperature no less than 1.7◦C (35◦ F) before being sold or imported. The 60-day rule means to offer protection against pathogenic microbes that could thrive in the moist environment of a soft cheese. While the FDA views raw-milk cheese as a potential biohazard, riddled with bad bugs, aﬁcionados see it as the reverse: as a traditional food made by the action of “good” microorganisms—bacteria, yeast, mold—on proteins found in milk that serve to protect the cheese from more harmful microflora. However, The FDA’s rules are not about to loosen. But if artisanal cheese-makers can’t alter America’s pasteurization laws, what options remain for them? Corporate dairies can live within the rules. In fact, through heavy lobbying of state and federal governments they write regulations to suit their operations. But for the niche dairy farmers, the same regulations are major impediments for their livelihood. It’s an strange situation – while politicians decry the demise of the family farm, they pass laws that in the name of food-safety that undermine these enterprising farmers. In terms of food safety, however, the US government says it knows best, and, what’s good for the giant dairies is good for the small family-size dairy farm. The government writes a single set of regulations that are designed for the huge dairy farms and dairies, where the many aspects of producing milk and milk products are all separated. Unlike small-scale farms, no one person is directly involved in all operations in a corporate dairy. No one is suggesting overthrowing the FDA—a safe food supply is not to be underestimated—however, a curious mix of political libertarians and foodies is questioning some of the motives and logics underpinning the Pasteurian food regime. In the meantime, I find it absolutely thrilling to see that American can-do attitude in full force that when someone or something – even our own government – stands in our way of our dreams, we become more creative, clever, and resourceful in order to adapt. I think that the beauty of American artisinal cheeses is that we are not like Europe, but completely our own. It is the struggles and challenges that the small-scale dairy farmers have faced that have given the most flavor to their cheese. While the Coalition will continue to fight for the freedom to create young, unpasteurized cheeses, I am curious to see, to be able to witness, the creations that occur in the aging caves in the U.S. Raw Milk Products in the U.S.: Volume 1: You Sell Raw Milk Cheese? Is That True? Categories: Raw Milk Products in the U.S. Series | Tags: artisinal farmers, FDA, Regulations | Permalink. History of Milk Pasteurization in the U.S. The pasteurization or aging of cheese was not regulated in the U.S. until 1949. Before then, there were only few preexisting standards by the FDA – standards of identity for only three American varieties of cheese – cheddar, colby, and washed curd and soaked curd cheese – were essentially quality control measures dictating milkfat content and production methods that contained no reference to pasteurization or aging. Prior to WWII, production in the American cheese industry was very similar to the practices found in Europe. Cheese manufacture was confined to smaller farms which drew on local milk supplies. It was not until cheese manufacturing was made at such a large-scale industrial process that milk from many dairy farms from multiple states was needed to enter the cheese production facilities. It was this interstate shipment and combining milk sources that put milk-safety in danger. The FDA had to acknowledge the dangers of the new cheese production procedures and in response, instituted pasteurization and aging requirements. The Health Research Group of Public of Public Citizen petitioned the Secretary of the Department of Health and Human Services (HHS) to promulgate a regulation banning all sales, interstate and intrastate, of raw milk and milk products in the United States on April 10, 1984. After a few months, the citizens’ group then ﬁled suit in federal district court to compel HHS to promulgate such a rule. The court ordered HHS to respond to the petition, ﬁnding that there had been unreasonable delay. The Commissioner of Food and Drugs then denied the petition, forcing the Health Research Group to seek judicial review. This time, its request for relief also challenged the agency’s failure to terminate the stay of the 1973 regulation which had required pasteurization of ﬂuid milk products through standards of identity. In Public Citizen v. Heckler , the court ruled that the denial of the petition had been arbitrary and capricious, and ordered the FDA to institute rule-making procedures for a regulation banning the interstate sale of all raw milk and milk products. The regulation applies to cheese as it applies to any other milk product and incorporates the standards of identity in 12 C.F.R. §133 for purposes of allowing certain cheeses to be aged at least 60 days instead of made from pasteurized milk. However, it wasn’t until, academic researchers in South Dakota took on the experiment of bacteria survival on raw milk in 1995 and demonstrated that Esherichia coli O157:H7 (E. coli) bacteria could survive the 60-day aging period. These results suggested that existing regulations were insuﬃcient to protect consumers from pathogens and that all cheese, whether fresh or aged over 60 days, should be made from pasteurized milk. Three years later, a trade group consisting of large-scale manufacturers of both specialty cheeses and process cheeses created a compilation of such relevant studies and contacted the FDA. That same year, the FDA announced that it would research whether pathogenic bacteria contained in raw milk cheese could survive the 60-day aging period. Such a discovery would justify a complete ban on interstate sales of raw milk cheese, making the current regulations even more restrictive. The FDA’s studies were funded by former President Clinton’s Food Safety Initiative and conducted by government researchers at the National Center of Food Safety and Technology in Chicago. In summary, the studies found that in the event that 60-day aging is found to be inadequate to provide the appropriate level of public health protection, an evaluation of alternative control measures would assist the agency in the development of policy in this area. Validation of the eﬀectiveness of current or alternative process control measures used in the manufacture of aged hard cheese would result in a greater assurance of a safe food supply and enhanced public conﬁdence in these products. However, the controversy was not finished yet. Catherine W. Donnelly, a professor in food microbiology at the University of Vermont, conducted an independent review of the FDA study as well as the 1995 South Dakota study. Donnelly found two critical ﬂaws in the design of the 1995 South Dakota study of E. coli: (1) the researchers had injected strains of E. coli into cheddar samples made from pasteurized milk, and (2) the samples were injected with several thousand times more bacteria than could realistically enter cheese during the manufacturing process. The ﬁrst design ﬂaw meant that E. coli bacteria were never exposed to lactic acid during fermentation, as would normally happen in manufacture of cheese from raw milk. The high acidity that occurs naturally in the cheese making process helps kill pathogens. The second design ﬂaw meant that the South Dakota study might have produced overly pessimistic and alarmist results. Publication of Donnelly’s independent research and activism by the Cheese of Choice Coalition produced suﬃciently negative publicity that the FDA’s review lost its priority status in 2002. As of when the referenced document was published, the FDA’s results, scheduled for release in September of 2002, have not been released. and What’s the Appeal of Raw Milk Cheese? This paper is submitted in satisfaction of the Food and Drug Law course paper and the Written Work Requirement at Harvard Law School. Categories: Raw Milk Products in the U.S. Series, Uncategorized | Permalink. You sell raw milk cheese? Is that true? This question has come up more than once. And so, it got me to thinking, what is the story behind this 60-day rule? Raw milk is un pasteurized milk from cows, goats, sheep, or other animals. It is thought, but not known exactly, that less than 1% of milk sold to consumers in the United States has not been pasteurized. What Contaminates Could Be Found In Raw Milk? According to the Center for Disease Control (CDC), raw milk can carry harmful bacteria and other germs that can make you very sick or kill you. A wide variety of bacteria (e.g., Brucella, Campylobacter, Listeria, Mycobacterium bovis (a cause of tuberculosis),Salmonella, Shiga toxin-producing Escherichia coli [e.g., E. coli O157], Shigella, Yersinia), viruses (e.g., norovirus), and parasites (e.g., Giardia) that can make people sick or on few occasions, be fatal are sometimes found in raw milk. The CDC also states that while it is possible to get foodborne illnesses from many different foods, raw milk is one of the riskiest of all. Pasteurization is the process of heating milk to a high enough temperature for a long enough time to kill illness-causing bacteria contained in the milk and is the only way to kill many of the bacteria in milk that can make people very sick. Pasteurized milk products have occasionally caused illnesses and outbreak because of germs introduced in the dairy after the pasteurization process. However, pasteurized milk that is correctly handled in the dairy, bottled, sealed, and refrigerated after pasteurization, and that is properly handled by the consumer, is very unlikely to contain illness-causing bacteria. Considering the amount of pasteurized milk consumed in the United States, illness from it is exceedingly rare. Categories: Raw Milk Products in the U.S. Series | Tags: bacteria, CDC, FDA, parasites, Pasteurization, Raw, virus | Permalink.